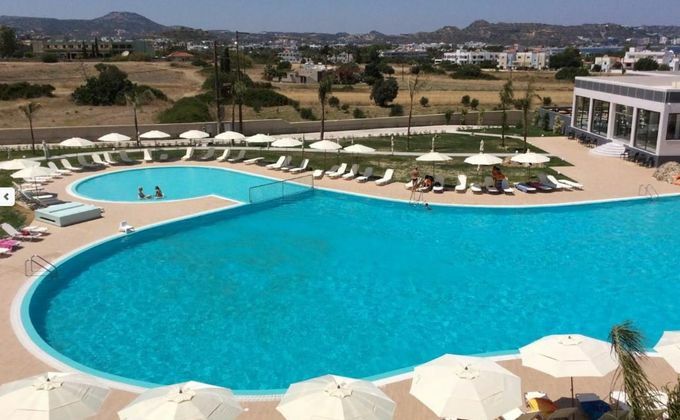 Located less than 600m from the beach, the 4 star Evita Sun Resort is on the outskirts of Faliraki but within walking distance of local bars and restaurants. The hotel offers a wide range of facilities; a fresh water outdoor pool, children's playground, kids club and regular daytime and evening entertainment. Return direct flights from Bournemouth, London Gatwick, Luton, Stansted, Bristol, Cardiff, East Midlands, Birmingham, Manchester, Liverpool, Leeds Bradford, Newcastle, Glasgow, Edinburgh or Belfast flying with various airlines dependent upon departure airport and date, please refer to dates and pricing.